Western Canada is a top spot for family vacations, especially for those who love the great outdoors. There are so many wonderful places to visit in Alberta and British Columbia, as well as an abundance of things to see and do. Rocky Mountaineer makes it easy for families by connecting a number of these exciting spots on their spectacular train routes. These cities and outdoor destinations have some of the most stunning scenery in the world, as well as marvelous family-friendly attractions and magnificent areas full of adventure and wildlife. Many Rocky Mountaineer rail journeys depart from Vancouver, one of the most family-friendly cities on the planet. Located in British Columbia, Vancouver offers lots of family fun - from outdoor activities and attractions to indoor science and nature treats. Families could easily spend a full vacation here, so it's wise to spend a few days exploring before your trip. There's so much to see and do. One of the best places to start is Vancouver's iconic Stanley Park. Located in downtown Vancouver, Stanley Park offers a wide array of activities for families. Go hiking or rent bikes and ride along the park's 5.5 mile sea wall path. Eat at one of Stanley Park's restaurants - the Fish House is my favorite. Take a horse-drawn carriage ride or a miniature train ride aboard a replica of Locomotive Engine #374, the first transcontinental passenger train to pull into Vancouver in 1886. If it's a hot summer day, cool off at the children's water park or the heated freshwater pool. In addition, Stanley Park's beaches are open from late May through Labour Day. Of course, a trip to Stanley Park wouldn't be complete without visiting the Vancouver Aquarium. This is Canada's largest aquarium, so allow plenty of time to view all the exhibits. Here you can view more than 33,700 fishes representing about 300 species, approximately 30,000 marine invertebrates such as jellyfish and octopuses, more than 56 types of amphibians and reptiles, and 21 species of birds and mammals from around the world. Shows at the Aquarium, such as beluga whale shows and sea otter feeding, take place throughout the day. Other great activities for families include visiting Science World at Telus World of Science, checking out Storyeum, taking an Aquabus to Granville Island with its shops, restaurants and children's market, or taking a Skyride or hike up Grouse Mountain for a panoramic view of Vancouver. Kids also enjoy visiting the more than 200 domestic animals and birds at Maplewood Farm, located on Vancouver's North Shore. One of my top activities was taking a walk across the 450-foot Capilano Suspension Bridge that stretches 230 feet above the Capilano River. There are lots of programs, nature tours and exhibits in this park area as well. Vancouver has loads of family-friendly accommodations - one of the best is the Fairmont Pacific Rim. This lovely 377-room world-class hotel is ideally situated in the heart of Vancouver and provides unobstructed views of Stanley Park, Coal Harbour, and Vancouver's North Shore mountains. The hotel features a rooftop pool and private cabanas with firepits, both casual and fine dining, a fully equipped fitness center, and the Willow Stream Spa. Convenience is a major plus here, both in terms of proximity to the attractions and ease of transfer. Rocky Mountaineer picks up at this hotel on the morning of your trip. If you're looking for family-friendly dining outside the hotel, try a White Spot restaurant. They offer a nice selection of reasonably priced meals and are all very kid-friendly. Rocky Mountaineer's Whistler Sea to Sky Climb route is a perfect trip for families with children of all ages. The route connects two of British Columbia's favorite family playgrounds - the coastal city of Vancouver and the mountain village of Whistler, host to the 2010 Winter Olympics and Paralympic Games. The scenery along this route is stunning, complete with cascading waterfalls, snowy mountain peaks, and rushing river canyons. From May through late September, the train departs North Vancouver at 8:30 a.m. and arrives in Whistler by 11:30 a.m., allowing families can stay for a few hours - or several days - before leaving at 3:00 p.m. for the return trip to Vancouver. The Whistler Sea to Sky Climb train features the historic open-air Heritage Observation Car, allowing for even closer unobstructed views of the route's scenic beauty. This is a great way for families to experience the adventure and excitement of the Rocky Mountaineer train, whether for the day or as an integral part of their Whistler vacation experience. Whistler is an awesome destination for a brief visit or a complete summer family vacations. Whistler Village has a European-style alpine atmosphere, complete with over 200 shops and 90 restaurants - some offering al fresco dining. Take the world record-breaking PEAK 2 PEAK Gondola connecting Whistler and Blackcomb Mountain, allowing access to over 50 kilometers of hiking trails through Whistler Blackcomb's pristine alpine environment. Check out the Blackcomb Base Adventure Zone for some adrenaline-fueled thrills, including luge rides, ziplining, rock climbing, trail rides, a climbing web, and a spin at zero gravity on the cool human gyroscope. The Squamish Lil'wat Cultural Centre provides a view into the cultural history and works of the region's Squamish and Lil'wat Nations. For those staying for several days, Whistler also offers a wide variety of exhilarating adventures including mountain biking on 4,900 vertical feet of lift-accessed trails, ATV tours, white water rafting, glacier skiing and more. Teens will love the area's Ziptrek Ecotours, a three-hour journey on a series of cables and suspension bridges. Summer day camps are offered for children ages 30 months to 8 years and bike camps are available for kids and teens who want to tune up their mountain biking skills. If your family is full of outdoor adventurers - this is a great place to be. Families who love nature and the outdoors should put Jasper at the top of their "must visit" list. This part of Alberta may not be as well known as neighboring Banff and Lake Louise, but that is part of its charm. This laid-back little town within a huge park is the perfect home base for adventure seekers and those who crave authentic, unspoiled destinations. Visitors won't be run over by crowds of tourists here and the wildlife is abundant. There's too much to do here for a one- or two-day trip (believe me, I tried! ), so plan on spending three nights or more hiking, taking in the scenery, and experiencing all of the area's attractions. The tiny town of Jasper grew up around its railway station, so arriving by train has a special charm. Car rentals and taxi services are available at Jasper's Heritage Railway Station located in the center of town, and most accommodations are located just a short drive away. A favorite is the four-star Sawridge Inn and Conference Centre, the last hotel built in the community of Jasper. Families love the Sawridge Inn's indoor heated pool, jacuzzi, outdoor hot tub, fitness center, and free wireless high-speed Internet access. Both casual and fine dining options are available. The on site tour desk offers a wide array of sightseeing options and the hotel's Mountain Wellness Day Spa provides a welcome place to relax and soothe sore hiking muscles. Jasper is home to Jasper National Park, Canada's largest Rocky Mountain Park, covering a total of 10,878 kilometers - almost 6,760 miles. This is one of Alberta's most spectacular regions, complete with thundering falls, snowcapped peaks, glacier-fed lakes and massive icefields. Wildlife is everywhere. It's quite common to see bighorn sheep, elk, deer, mountain goats, coyote, moose, and black bear throughout the entire area. I saw all of these, as well as a lone grizzly bear, during my short stay there. Outdoors is the place for families to be in Jasper. Jasper Raft Tours offers easy, 2-3 hour rafting trips that are perfect for families and multigenerational groups. Sundog Tours can take families to visit iconic Athabasca Glacier and the Columbia Icefields, for a hike up massive Mount Edith Cavell, or on helicopter tours to see the glaciers or to go heli-hiking. 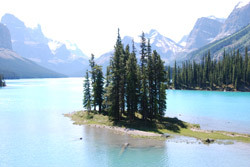 Don't miss their Maligne Valley Sightseeing Tour and Boat Cruise along picturesque Maligne Lake to Spirit Island. Bears, bighorn sheep, elk, and other kinds of wildlife are plentiful along this route and the postcard-perfect scenery is magnificent. For those who are not renting a car, Sundog Tours also provides transportation to the Banff/Lake Louise area and to the international airports in Calgary and Edmonton. Spend a few hours exploring Whistlers Mountain with the Jasper Tramway, Canada's highest and longest aerial tramway. The panoramic views from 7472 feet above sea level are breathtaking. Make sure to allow some time for strolling along the boardwalks looking for wildlife inhabiting this high alpine area. Families will also enjoy visiting Miette Hot Springs, located about an hour north of Jasper. These are the hottest mineral springs in the Canadian Rockies, with two pools kept at 104-degrees Fahrenheit and two refreshing pools for cooling off. Bring bathing suits and towels - full facilities (lockers, showers, changing rooms) and a restaurant are available on site. 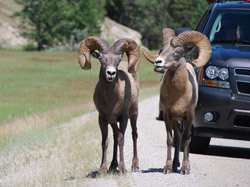 The drive up to the hot springs transits some of the best wildlife terrain that Jasper has to offer. It's likely that you'll see elk, mountain goats, deer, eagles and more. Jasper Adventure Centre, a full-service tour company offering wildlife safaris, canoeing trips, nature walks, and loads of sightseeing adventures, can take you there. * For more information on planning vacations in Canada, visit www.canada.travel. For more information on planning trips to British Columbia, visit www.hellobc.com. Vancouver tourism suggestions are available at www.tourismvancouver.com. Details on family vacations packages, accommodations and activities at Whistler Blackcomb Resort are available at www.whistlerblackcomb.com. * For more information on planning family vacations to Alberta, visit www.travelalberta.com. For details on all that Jasper has to offer, visit www.jasper.travel. To learn more about the Rocky Mountaineer vacation experience for families, read this companion article on the Family Travel Network.